Inspired by the classic ‘The moonstone’ by Wilkie Collins, this novel brings the mystery and intrigue of the past into the 21st century. 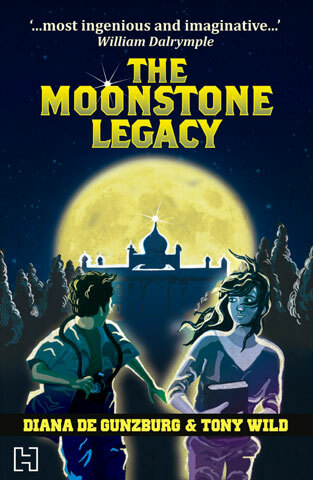 Story is about ‘The moonstone’, a precious and sacred stone which was stolen by George Abercrombie from Gujarat, India and the curse which follows their family because of it on creepy full moon day. Story is about Lizzy Abercrombie, a 14 year old girl, who discovers that there is a mystery behind her mother’s death and finds that there is a curse on Abercrombie family. She takes help of her Indian friend Ravi Chandra, travels to India, finds a chronicle of her ancestor George Abercrombie, and finds that the moonstone is stolen by George from Somnath temple in Gujarat. She deciphers each and every detail written in chronicle to find out where the precious stone is hidden in exotic mansion called ‘Shalimar’ in Yorkshire moors in England. She risks her life to save the diamond from famous Indian writer Shankar pujari to return it to the temple back. Will she succeed in this process? Author impresses us with perfect characterization. We can actually feel and understand Lizzy’s mind set by reading the book. The way landscapes of India and Shalimar are explained with every detail is excellent. Unlike the novel ‘The moonstone’, where the emphasis or focus in much on British, this novel also covers Indian cities, history, the mindset of Indians when British conquered etc., Excerpts from novel like below about cricket show author’s humorous touch to the storyline and novel is interesting to read throughout. It really is a good thriller with gripping story line and page-turner for sure. Climax is simply superb. An enjoyable read throughout. So, if you are still thinking if you should pick up this book to read, just go ahead and let me know how you felt :) It is Rs.200 in flipkart.com. Might pick this once am done with my pile of books.